A full-color, 12″ wide format touch screen display guides the operator, with all operations presented in an intuitive, easy-to- understand format. Setup is fast and simple, with no complicated codes to memorize or reference. The current backgauge position is clearly displayed in inches, centimeters or millimeters, depending on operator preference. microcut PLUS WS moves the backgauge into correct position faster and more accurately than skilled manual operation. The confidence of computer-controlled precision translates into significant increases in productivity – often 50% and more. The system’s proprietary DC drive assures mechanical repeatability of the backgauge position to ± .002 inches (.05 mm) regardless of leadscrew wear. microcut PLUS WS memorizes cutting sequences instantly, stores them indefinitely, and recalls them at the touch of a button. The system frees the operator from the wasted time and risk of error associated with repetitive data entry. Its ability to automatically program a job while cutting the first lift turns setup time into production time, making automation effective for even two and three lift jobs. The entry and review of programs is quick and easy. 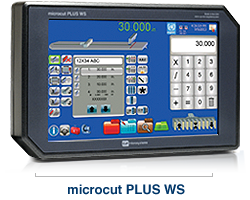 Advanced programming options include label and sheet divide, allowing complicated jobs to be programmed with only a few data entries, with screen graphics further simplifying the process. Fractions, lay changes, additions, or deletions can be easily entered through the keyboard. A proprietary power console accepts a broad range of voltages, 50 or 60 Hz, and has optional provisions for control of air on the cutter table. Additional features include a network connection and a USB port for data exchange and software updates. It also serves as an inexpensive medium for storing job data. microcip®PIA/GATF InterTech Technology Award winning software allows the importation and conversion of standardized CIP/JDF files into cutting programs. microfacts®, the industry’s first real time automatic data collection system for paper cutters, captures information relative to the job and machine for downloading to a PC. cutternet® allows one or more cutters to be networked for data exchange or programming. Many paper cutters already have some form of automatic backgauge control, but may have become difficult and expensive, if not impossible, to maintain. These machines are generally sound mechanically and, with the addition of microcut PLUS WS, can quickly and easily be returned to a high level of productivity and reliability for a fraction of the cost of a new machine. All microcut® systems are designed for ease of operation and years of trouble-free service. In the unlikely event service is required, on-board diagnostics, together with modular construction and plug-in connectors, insure Microsystem’s ability to provide timely and responsive after-sale support.